Last Tuesday I had mentioned (almost as a joke) that I wanted to start a DIY Collective. Ever since I mentioned it, I could not get it out of my head. I was amazed to get so many responses and emails encouraging me to start something like this. So Wednesday night I sketched it out, Thursday I started doing a Wordpress mock-up, and then on Friday Chris told me that I should pitch my idea to Capital Factory. Capital Factory is an "an early stage accelerator program for tech startups that provides a small amount of seed capital and weekly mentoring sessions by entrepreneurs who have founded successful companies" based here in Austin. At first I was like, "Tech startup? Me? Uh, I'm just a blogger on Blogger...", so I tried to put all that out of my mind and just crank out a base site for you guys that we could use ASAP (please keep in mind I'm not a developer or designer at all!). As I was working away, I could not get the idea of pitching this to Capital Factory out of my head. I spent Saturday brainstorming with my friend and awesome web developer Jib on how we could actually make Made This/ Love This awesome in the future. Folks, I think we're on to something! I spent Sunday formulating my pitch and application to Capital Factory, and I spent today filming the first (of many!) 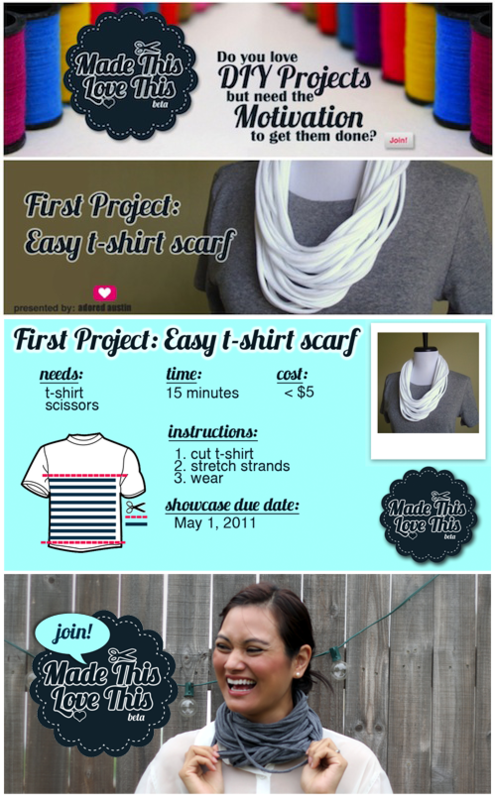 projects, which is a very simple t-shirt scarf (no sewing skills required!). I know that I had mentioned that I wanted to take on sewing projects, and yes, I realize that there is no sewing involved with the t-shirt scarf, but I wanted to start easy and to involve as many people as possible. I hope you'll get involved! Please check out Made This / Love This, sign up (it's free! ), and submit photos of your own t-shirt scarf creations and variations by May first! Thank you so much for your support and encouragement in my new project! I have the best readers in the entire world, and I hope we can all enjoy Made This / Love This together.